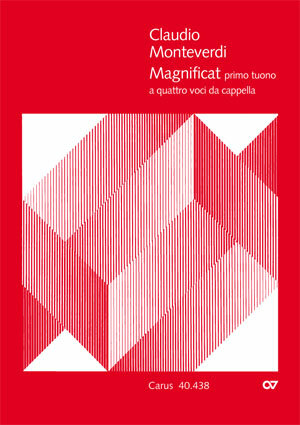 Das in dieser Ausgabe vorliegende "Magnificat" ist eine Alternatim-Komposition - d.h. Polyphonie alternierend mit Choral - und stellt als solche die konservative Seite von Monteverdis Schaffen dar. Dieses Magnificat findet sich zusammen mit einem weiteren (bereits im Carus-Verlag erschienen) in „Selva morale“ von 1640, Monteverdis einziger Sammlung geistlicher Musik, die während seiner Jahre in Venedig zum Druck gelangte. Auch in dieser Komposition herrscht die Mannigfaltigkeit der Musiksprache des maestro di capella vor. Das Magnificat ist wohl für eine außerordentliche Aufführung an der herzoglichen Basilika San Marco geschrieben. Überaus beeindruckend ist die Abwechslung in der formalen Organisation seiner groß angelegten Musik. Besonders bemerkenswert ist die Verwendung eines Refrains („fecit potentiam in brachio suo“), um die Bilder der Macht zu verstärken: Eine fünf- zehntaktige Repetition eines G-Dur-Akkordes zeigt Monteverdi nicht nur als psychologisch gewieften Dramatiker, das Magnificat ist ein sinnfälliges Beispiel für den stile concitato. Das etwa 13-minütige Werk gliedert sich in drei breite Abschnitte: Magnificat - Et misericordia, Fecit potentiam - Esurientes, Suscepit Israel - Amen. Der erste Abschnitt wird bestimmt von Tutti-Chorklängen mit einer zentralen kontrastierenden Episode für zwei Soprane, die später mit den übrigen chorischen und instrumentalen Kräften dialogisieren. Im Mittelabschnitt findet sich die oben erwähnte stile-concitato-Technik, um drei aufeinanderfolgende Duette einzuleiten. Reiche homophone und kontrapunktische Vielfalt chorischer und instrumentaler Texturen bestimmt den Schlussabschnitt. Von erlesen ausgewählten Farbwerten ist das Instrumentalensemble: Zwei Violinen und vier Posaunen sind Monteverdis Idealfarben, als Besetzungsalternativen schlägt er statt der Posaunen vier Gamben vor oder - falls auch diese nicht verfügbar sind - drei Bratschen und Violoncello. Ausdrücklich bietet Monteverdi im Titel seines Magnificat auch die Möglichkeit an, auf Posaunen oder Violen ganz zu verzichten und nur den Basso continuo zu benutzen. Selbstredend büßt dann das Werk aber viel von seinem Charakter und stilistischen Identität ein. 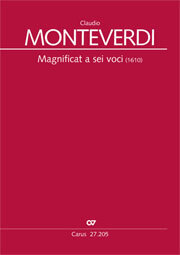 The four-voice Magnificat is from “Selva morale e spirtuale” (1640), Monteverdi's compendium of sacred music for voices and instruments. A festive setting of the Marian text, this work of moderate difficulty is suitable for performances by college choirs and early music ensembles. […] David Blazey's authoritative edition provides useful information regarding performance practice. 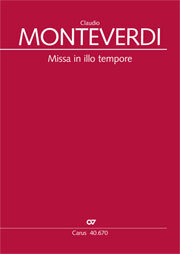 The publication is clean and practical, meeting most ACDA/MPA standards (no translation of the Latin text is incIuded). The score is helpfully edited with contemporary clefs, though archaic rhythmic notation using long note values is employed. In the preface, Blazey suggests that the work may have been performed down a fourth or fifth. While this is impractical for today's mixed-voice choirs, transposition a major second down makes the third part more accessible to tenors, without making the second part too low for most female altos. The ranges and tessituras of the soprano, alto, and bass parts are quite reasonable. The third part, however, frequently includes g1 and a1 for tenors and remains mostly above C1, making it difficult to sustain. Since it often descends to g or f at cadences and other important points, a strong, yet resonant tone may be difficult to achieve by substituting female altos. If no transposition is used, and in the absence of male altos or countertenors, a combination of low female altos and high tenors may best serve the demands of the part. 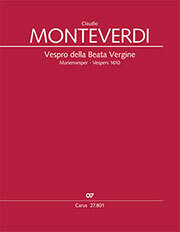 ”Selva morale” includes an organ partbook in which a basso continuo part for the Magnificat is contained. Apparently realized by the editor, the part mostly doubles vocal lines and occasionally provides additional rhythmic or melodic interest. The piece may be performed with or without continuo Instruments. Though not as difficult as the Vespers of 1610 or same of Monteverdi's highly polyphonic madrigals, this work may prove too challenging for groups unaccustomed to the amount of independence required and the old-fashioned rhythmic notation in long notes. The compositional craft that creates interest and variety in the setting also provides a great challenge to the chorister inexperienced in this musical style. 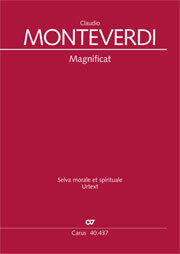 For those up to the challenge, this Magnificat is an excellent introduction to Monteverdi's choral works and an expressive, joyous illumination of the Marian text.